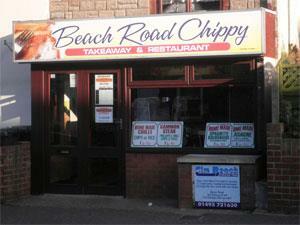 Beach Road Chippy in the village of Caister-on-Sea near Great Yarmouth serves a range of meals and takeaway items. Enjoy traditional food seated indoors or pick up a night off treat to takeaway. A popular choice with locals and visitors. On arrival in Great Yarmouth follow signs for the A149 towards Caister-on-Sea, proceeding straight ahead at the Yarmouth Stadium mini roundabout into the village. Proceed over the next roundabout and then take a right turn at the next mini roundabout onto Beach Road where Beach Road Chippy is located immediately on the left hand side.